After last week's 5th plant started to show we were excited to see the development that would have happened. We were met with disappointment. 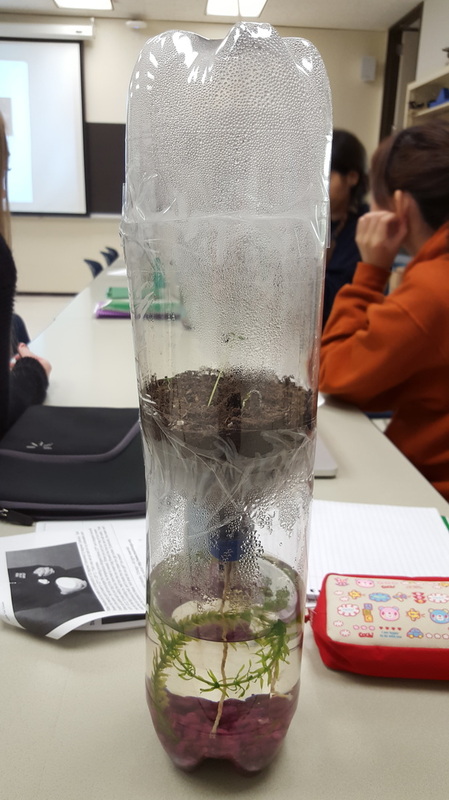 Unfortunately, our plants started to droop down, they were starting to get moldy, our largest plant had fallen over completely. It was rather disheartening. 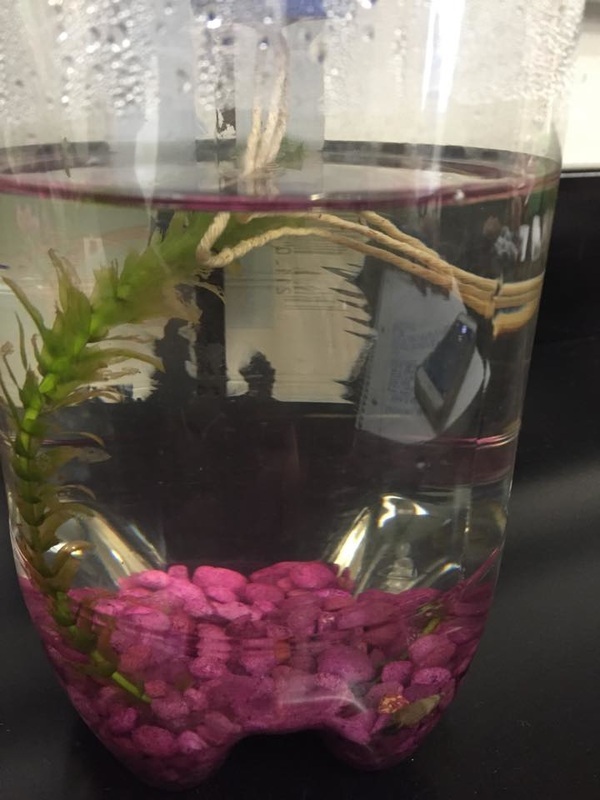 Picture shows no new plant growth and some even started to droop down. 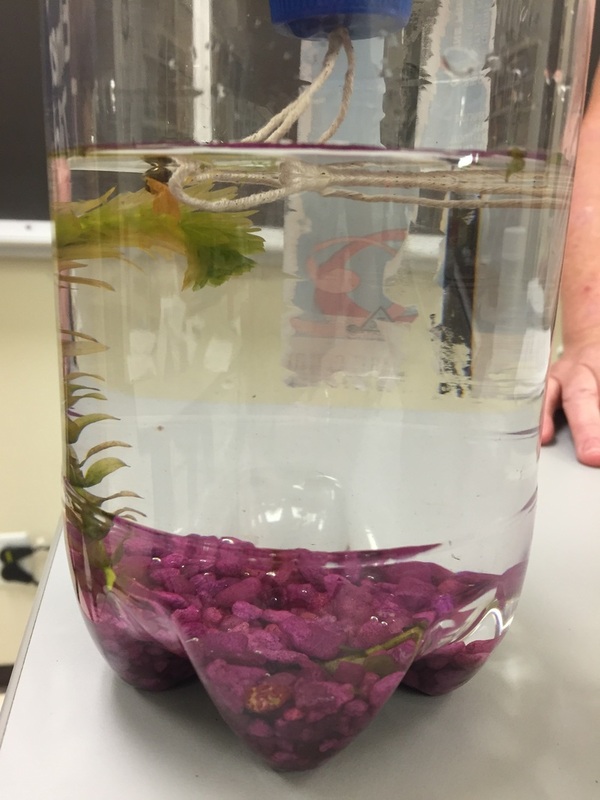 None of the plants showed any seemingly significant growth. In fact, one appears to have disappeared completely! When we looked closely we inferred that it had died and been pushed down by a clump of soil that had always been stuck on top of it. Overall the dirt looks pretty dry. that may have had an impact on the apparent declining health of our plants. Pictured shows that one of our sprouts has disappeared. 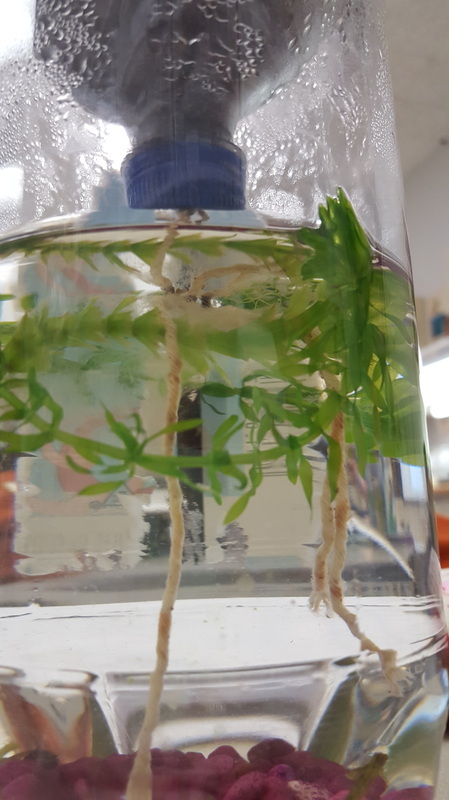 Again, the Elodea is even longer! But the webbing at the top seems to be almost taking over the plant. The water clarity is the same and the snails have both moved. Our water level is about the same as it was last week. 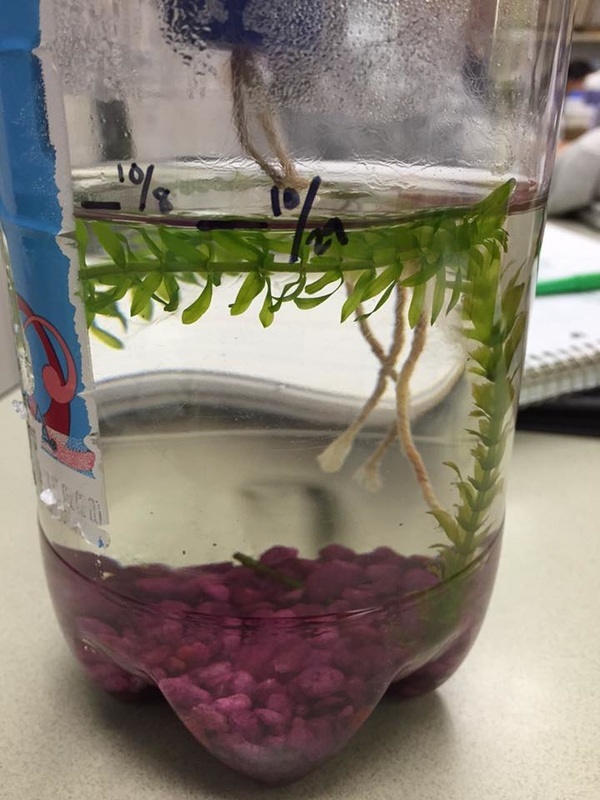 Picture shows the Elodea clearly grew longer. 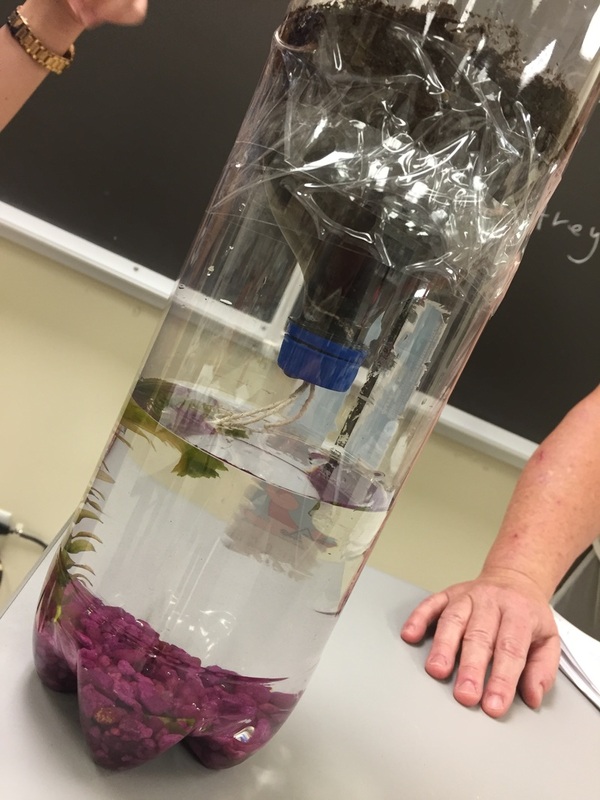 Was our terrarium a success? Well, yes and no. Yes, we were able to start growing viable flowers. 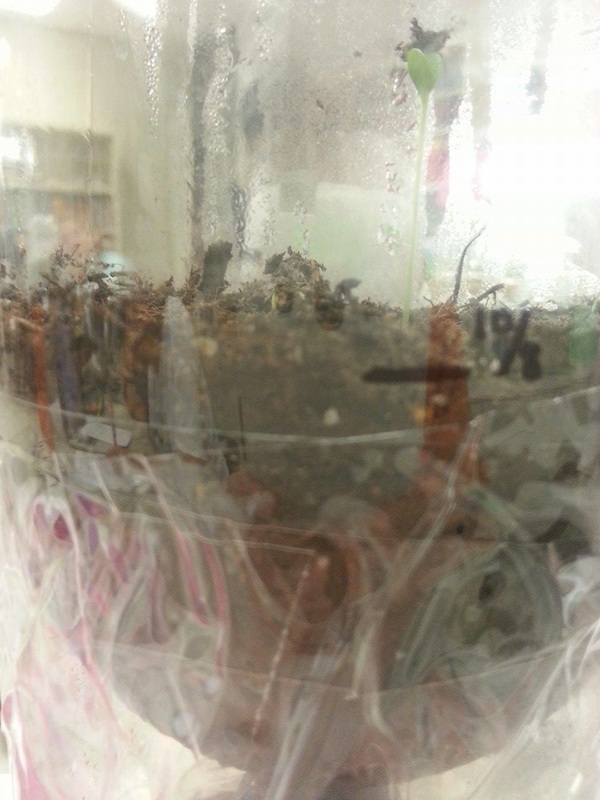 And who knows what would have happened to the remaining seedlings if we let the terrarium sit for a few more weeks. But what we do know is that the soil kept getting drier and drier over time and at this point we didn't see any sort of a turnaround. But there are a lot of unknowns about our final observations. 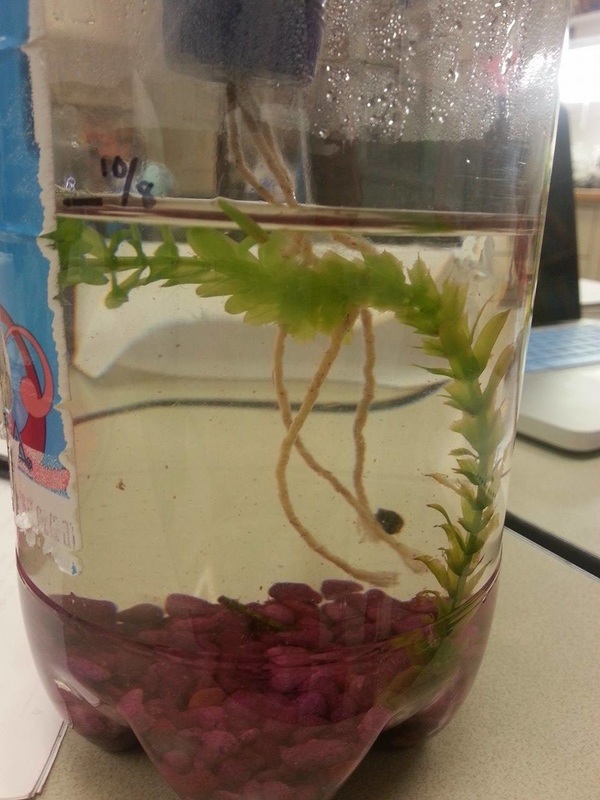 What is that webbing coming off of the Elodea? 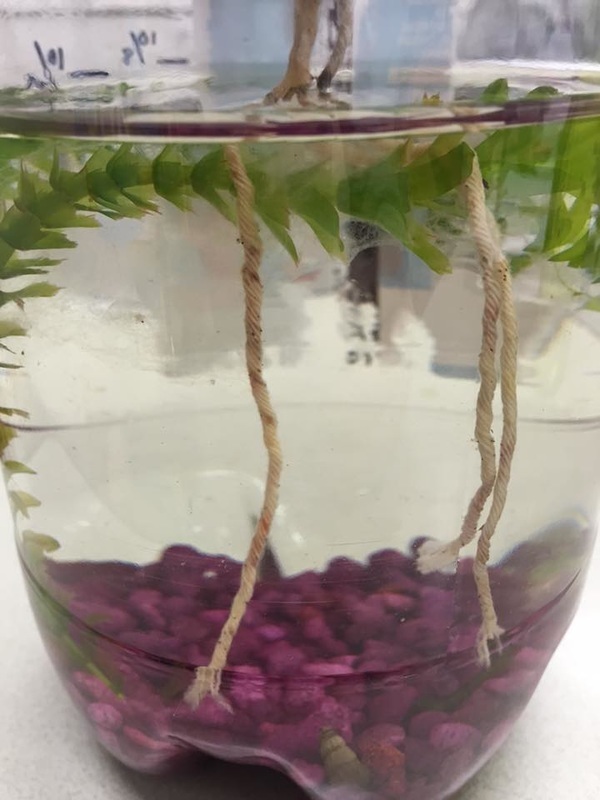 Is it in fact mold growing on the dirt where the plant fell and on the strings on the water side of the terrarium? How exactly did the condensation get there? 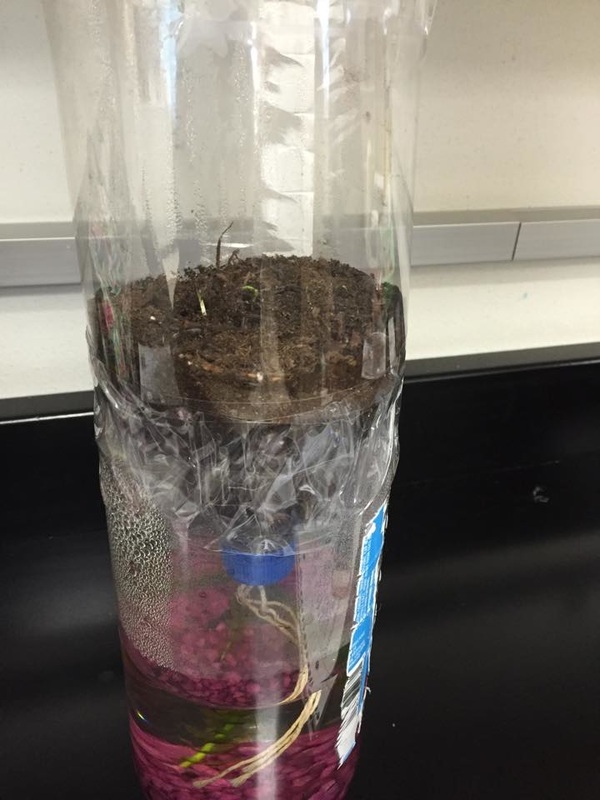 How does the condensation affect the soil/seedling half of the ecosystem? 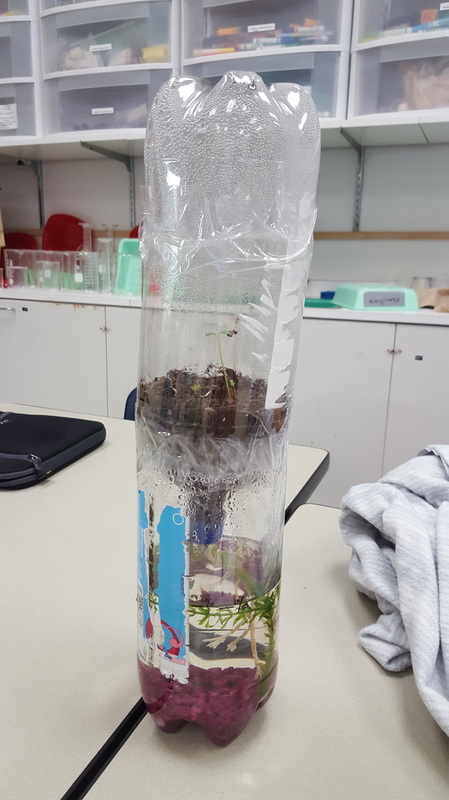 The height of our tallest plant is up to almost 6 cm. Wow! 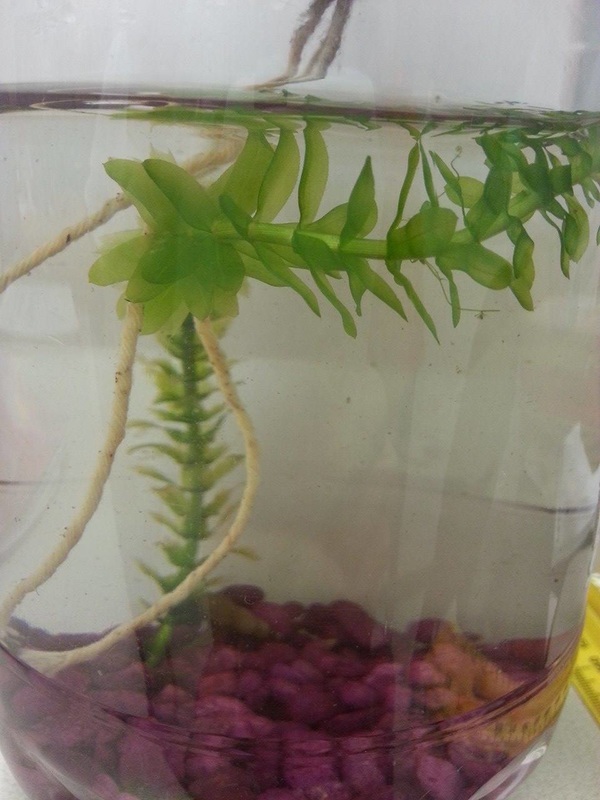 Our other plants are 2 cm, 3 cm, and 3.5 cm. Our smallest plant doesn't seem to have grown. But wait! 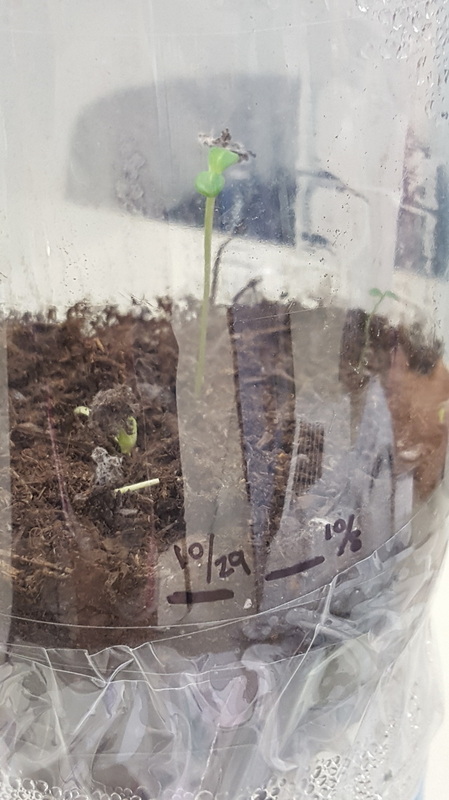 A little tiny plant is starting to emerge along one of the edges of the bottle. So now we have 5 sprouts all together. There also appears to be small amounts of mold growing on the dirt. Our Elodea is much longer than it was last week and the webbing towards the top of the Elodea is much more extensive than it was last week. The water clarity is the same as it was last week. 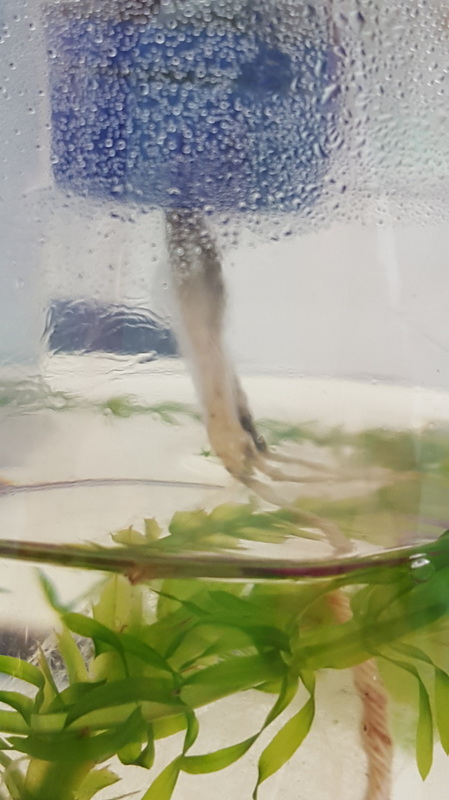 One of our snails seems to be very active while the other has stayed in a similar spot for the past couple of weeks, but it has moved away from the spot we marked before. Our water level has stayed pretty constant. It is about the same level that it was last week. 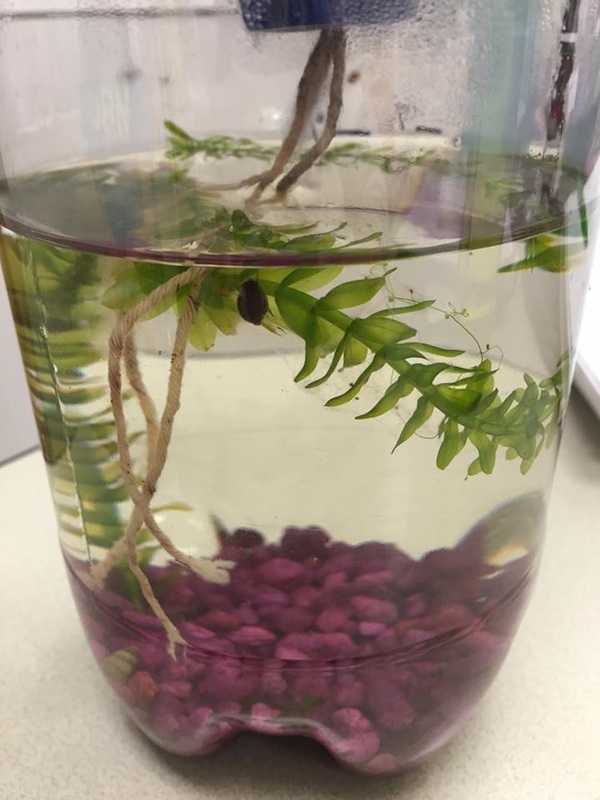 Snail is active and alive! Seeing new growth popping up, especially after this much time, is exciting! I'm glad we get to have another observation next week so that we can see how much else will change in the upcoming week. Wow! 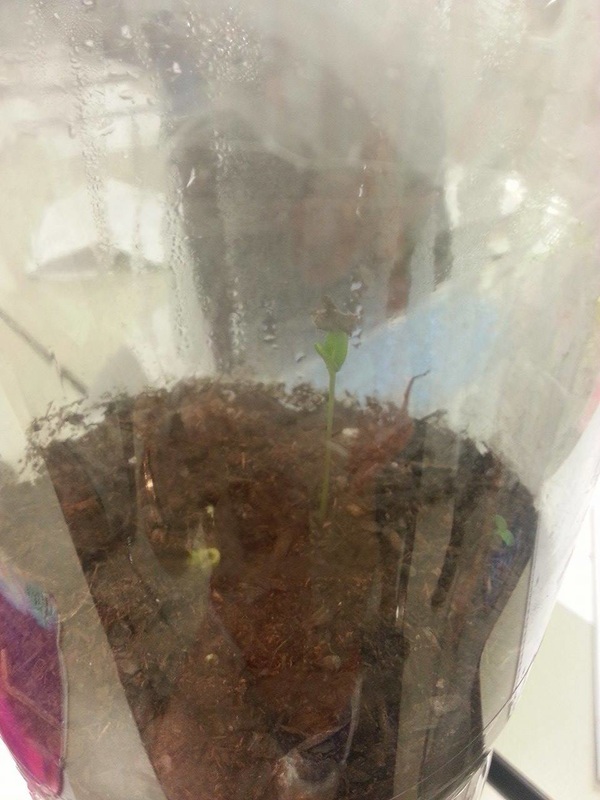 We have four seedlings growing so far this week! Each is a different height but overall they all seem to be doing strong. Upon getting the bottle our first observation was that there was quite a bit of condensation, much more than last week. Why is this? Could it be due to the time of day? 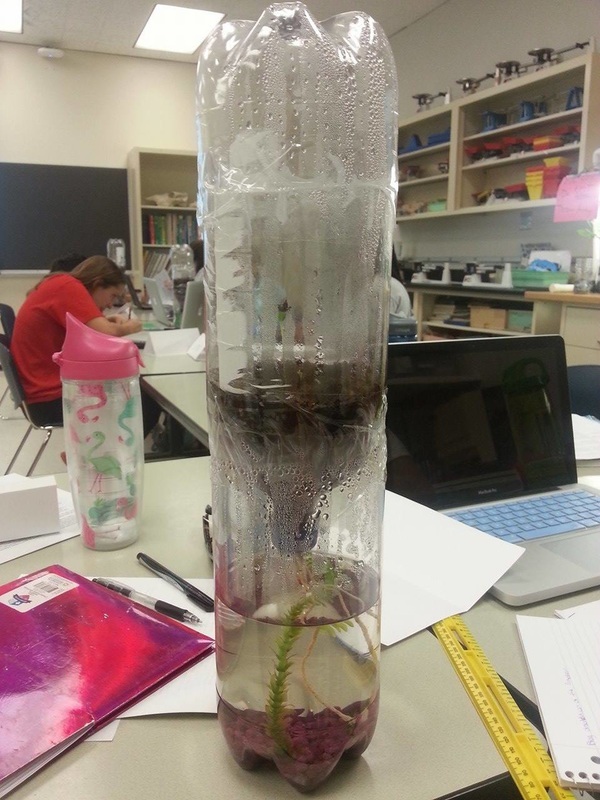 Or a higher level of plant respiration inside the system? We're interested to see what the condensation will be like during week 4. 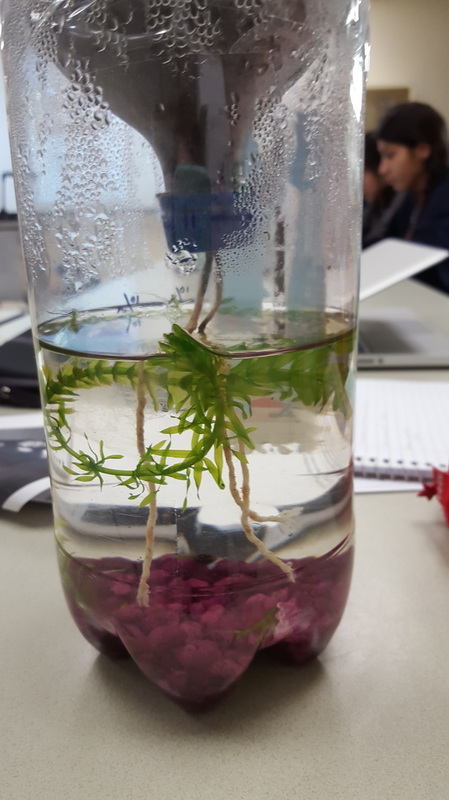 The plants range from barely popping out of the soil to about 5 cm. Two of the plants still have dirt nested on top of the growing plants. I wonder what impact that may have on the plants or when the dirt may fall back down. The dirt level seems to be slightly lower. Is it negligible? Will it keep changing and getting lower over time? 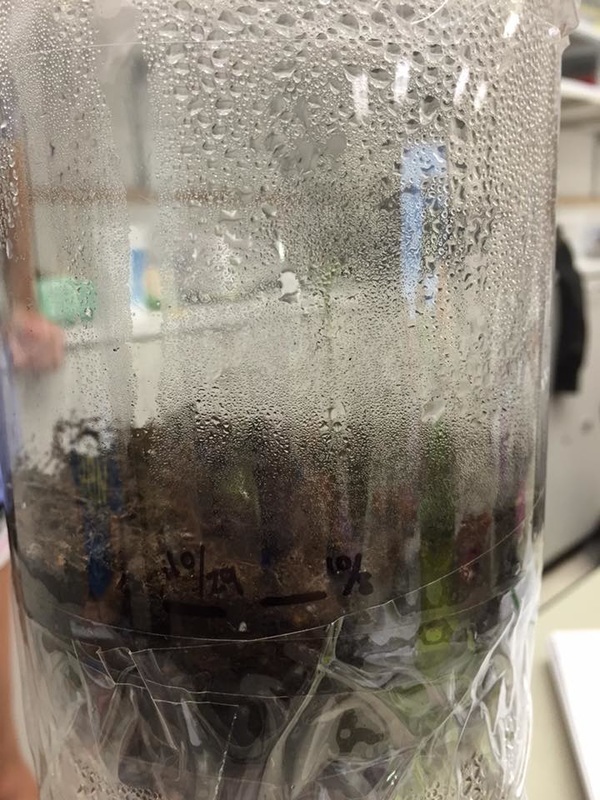 Was the dirt just settling or did something in the system cause a change? The dirt seemed moist but not wet. Today our terrarium is a week old! We noticed two sprouts. 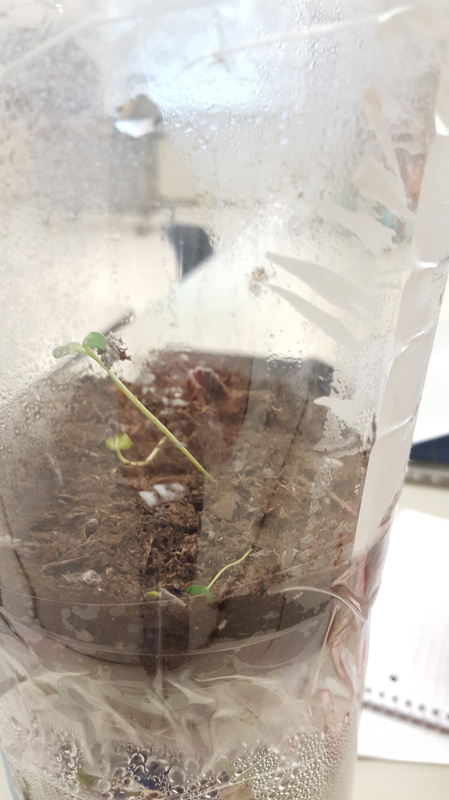 One of the sprout is pushing up the soil, and the other one is sprouting with no soils attached on top of it. 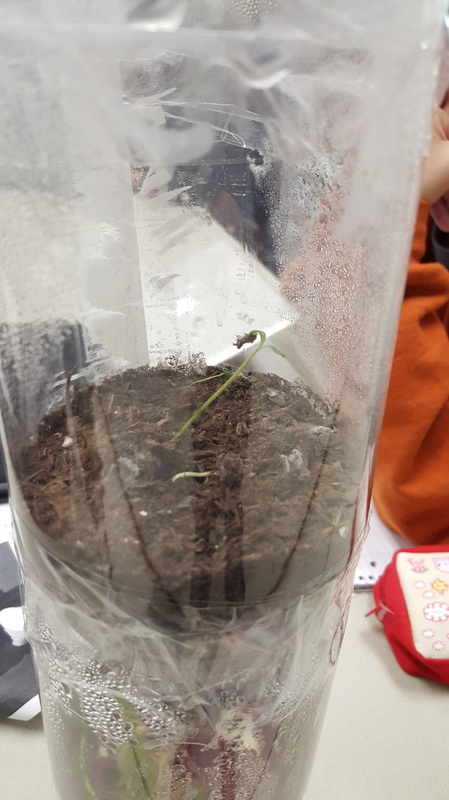 Both sprouts are approximately 1 cm. tall. We noticed condensation and evaporation happening due to evidence of droplets of water attached on the surfaces of both the top and bottom portion of our bottle. We also found that both of our snails are still alive. One is on the bottom of the bottom, on top of the rock, and the other one is moving on the string. The water inside our bottle is still pretty clear with no visible particles. 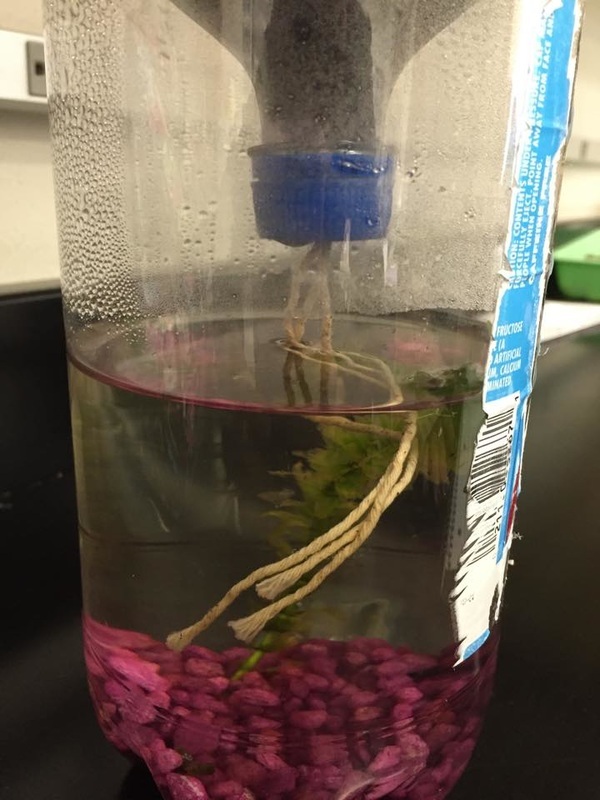 We couldn't really find the Daphnia because they were really tiny and hard to see. We also marked where our water and soil level was at so we can compare with our future observations. Bottom of our terrarium. One of the snail is on the bottom right hand corner. Another snail is attached to the string!